Our Passion is planning and protecting your future. Mindy provides a menagerie of elder law and estate planning services that are designed and tuned to you and your family's needs. WE CAN HELP YOU design an estate plan that is tuned to your family and personal needs so that your future can be protected. OUR FIRM has the experience and the technical knowledge to help you and your family negate the significant cost that is associated with long-term care. WHO WILL TAKE CARE OF YOUR PETS WHEN THE TIME COMES? 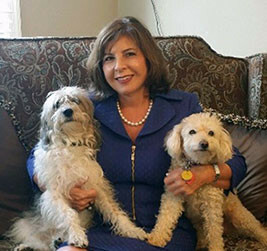 Mindy is a specialist in developing pet trusts. We can help you ensure that your pets have the appropriate resources to ensure your pets have appropriate care. AS A VETERAN, YOU MAY BE ELIGIBLE to obtain a tax free income. Let our team help you in the claims process to receive these benefits and others you may not be aware of. LOOKING FOR A BOCA RATON, DELRAY BEACH, BOYNTON BEACH, PALM BEACH GARDENS or FLORIDA ELDER LAW FIRM? Mindy Felinton has over 35 years of experience in providing elder law and elder care services to the elder community across Florida. MINDY COVERS ALL ASPECTS OF ELDER LAW Our services include: Medicaid Planning, Veterans Benefits, Nursing Home Planning, Asset Protection and acting as an advocate and advisor for our clients and their families. OUR FOCUS is to construct an estate plan for you and your family's future. We want you to protect and preserve the well-earned lifetime of savings that you and your family is entitled to. Interested in reading Mindy's FULL biography, click here. For more information, visit FelintonLaw.com.